The single-storey, three-bedroom residence sits in the grounds of a Victorian mansion block. 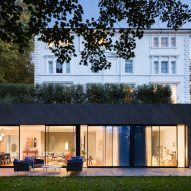 It was completed by Claridge Architects in 2015, but the interior design had been overseen by a developer. 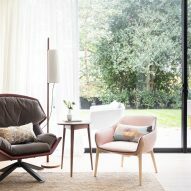 Black & Milk was brought on board to update the interior for its new owner, who agreed it was "time to ditch the 'vanilla' and inject some personality" into the home. 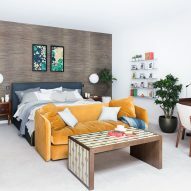 "They loved its location in Hampstead, north London, a neighbourhood with a village feel bordered by heathland and woods, but weren’t keen on the generic, luxury look the developer had chosen for its interior," said the studio. 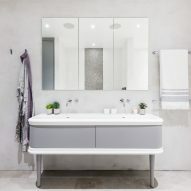 "The house is minimal and contemporary, yet its decor was more suited to a period home with high ceilings," it added. 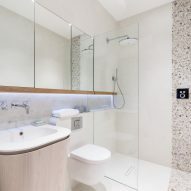 "The new owners wanted modern interior design, to complement the property's exciting architecture." 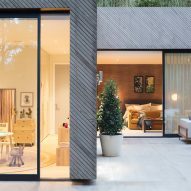 Wide oak boards cover the heated floors of the living spaces while hemp rugs sourced from Australia complement the natural fibre wallpaper of the open-planned lounge, which opens onto the garden through floor-to-ceiling windows. 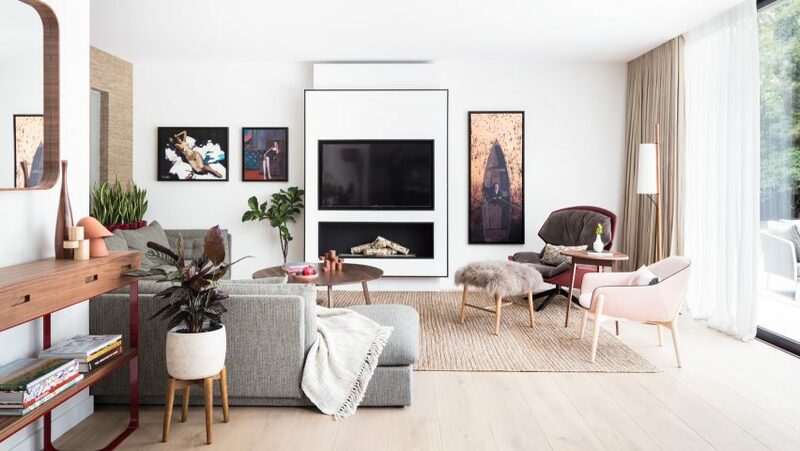 A contemporary fireplace and TV protrude from a monochrome chimney breast, creating a focal point for a range of seating, including a grey corner sofa from Scandinavian design firm Norr11 and red leather Clarissa hood armchair designed by Patricia Urquiola. The study is furnished with pieces including the Harold Desk by Luca Nichetto and Porto Chair by Matthew Hilton. "Creative styling transforms a good-looking house into a really personal and complete home. 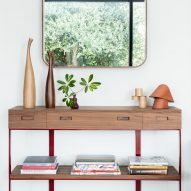 That's why we spent lots of time choosing the right accessories and textiles," said the studio. Three round bespoke pendant lights from the Philippines hang from the high ceiling above an extendable wooden table, while white linen curtains allow natural light to flood the dining area. Black timber forms the splashback of the kitchen, contrasting the flush white countertops to create a monochromatic space dotted with plants, which can be seen in every room of the house. 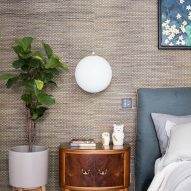 A textured wallpaper forms a feature wall in the colourful master bedroom, where a mustard velvet sofa that sits at the rear of a navy upholstered bed. 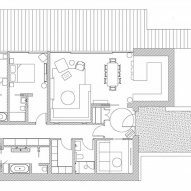 the floor-to-ceiling sliding door of the master bedroom opens up to a seated patio area, which maintains an element of privacy from the rest of the garden due to the L-shaped wall. 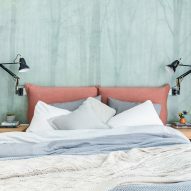 Light blue wallpaper with a faint silhouette of a forest creates a feature wall behind a salmon bed in the guest bedroom, while the remainder of the room remains neutral in colour. 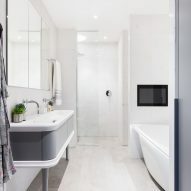 The guest shower concealed behind a bespoke glass partition is framed in black iron, which echoes the framework of the sink and floor-to-ceiling storage unit. Rich textures continue through to the children's bedrooms, with a large floral print wallpaper and pink curtains dressing the windows. "Dusky-rose curtains complement, to create a scheme that's unexpected and not remotely babyish," said the designers. Frames which have been individually designed by the studio dress the international artwork collected by the clients and can be seen throughout the property. 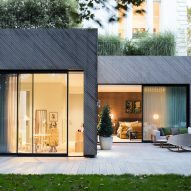 Diagonal strips of timber clad the exterior of the Claridge Architects-designed residence, which also features a rooftop garden that can be used by neighbouring residents.